By: Michael J. Rice Ph.D., ARNP. BC. 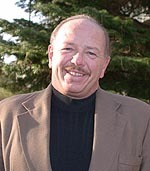 Michael has been employed by the Washington State College of Nursing, Spokane Washington since 1989. An associate professor, he teaches in the Psychiatric Nurse Practitioner Program. He received his Master's Degree in Psychiatric Nursing from the College of Nursing at the University of Nebraska Medical Center, Omaha Nebraska in 1976. He received his PH.D in Clinical Nursing Research from the University of Arizona College of Nursing in 1988. He has been board certified by ANCC in Psychiatric Mental Health since 1995 and is licensed as a Psychiatric ARNP in Washington State. He also has a private practice at the Suncrest Wellness Center which is located in Steven's County Washington, a federally designated medically underserved rural community. He is a strong advocate for the use of technology to meet health care needs in rural communities and the recipient of the prestigious EDUCAUSE 2002 Award for Excellence in Technology Solutions. Health care practitioners in rural areas have limited access to expert consultants and resource knowledge bases. The opportunity to become informed on the use and application of the newest medications, essential patient and family teaching and to check potential drug-drug interactions is hampered in rural and medically underserved communities because specialists often reside in more urban settings. While many knowledge bases are available on line, there are limitations in rural and medically underserved areas because of the digital divide, or a lack of access to information technology resources in rural communities. The advent of Personal Digital Assistants (PDAs) and their use in health care possess the potential for resolving many of these resource problems. Yet, health care professionals familiarity with PDAs must begin in their educational programs. Washington State is sparsely populated with a total population of fewer than two million who reside in an area of over 100,000 square miles. The vast distances have a negative impact on health care and thirty-six areas in 39 counties are federally designated as medically underserved or suffer from health professional shortages. When compared to the eastern seaboard, Washington State's land mass covers 7-8 states (Figure 1). Addressing these issues is difficult due to the distances which hamper access to clinical experts and educational resources. These problems are being addressed by the Intercollegiate College of Nursing/Washington State University College of Nursing, which has the mission of preparing graduate and undergraduate students in multiple locations throughout the region. The ICN\WSU College of nursing has received national and international recognition for its excellence in design and support of distance education. One of the more innovative projects, has been the Medically Indigent Rural Area (MIRA) Psychiatric Nurse Practitioner Program funded by the Health and Resource Services Administration. The MIRA program has been has been addressing these issues through the innovative use of technologies to bridge the digital divide and offer graduate psychiatric nursing education to rural and medically underserved communities. The MIRA program was awarded to prestigious EDUCAUSE 2002 award for Excellence in Technology and has had an increase in enrollment by over 900 percent. The effect of the innovative distance education technology has had a significant impact on rural communities and over 90 percent of all graduates now practice in rural areas. As ICN's distance education programs for mental health professionals has advanced, graduates have identified that they do not have easy access to expert information and consultation, as do providers in more urban areas. Often, access to this information makes the difference of treating and keeping clients in the rural community near jobs, families, and friends. The absence of current information often results in patients transported to locations, facilities, and services hundreds of miles from their homes. The MIRA program is now addressing the issue of current medication information using PDA's during the student's education. MIRA Psychiatric Nurse Practitioner students in clinical settings will receive one of 33 PDA devices with a drug database and extensive training on clinical applications. The College of Nursing MIRA program received the grant sponsored by Suffolk County Community College and Symbol Technologies, manufacturer of the PDA. The grant provides 33 Windows CE based PPT 2700 Series, a member of the family of Pocket PC-based terminals from Symbol Technologies. The PDA's are rugged PDA's using a Pocket PC platform with a simple, fast touch screen interface, and Internet browsing capabilities. The PDA's use Intel StrongARM SA 1110 processor, running at 206 MHz and come with 16 megabytes of memory. The PDA's are ideal for students in rural settings as Symbol's drop; sealing and temperature specifications are excellent. In addition to the basic Windows CE programs, the PDA's contain an extensive drug data base program called Dr. Drug's. The Dr. Drugs program is published by FA Davis, powered by Skyscape and includes brand names, dosing, detailed mechanisms, toxicity, and pharmacodynamics for more than 3900 mediations. Dr. Drugs was selected for the students because the program is very detailed and has an extensive database on natural compounds, costs, generic availability, and patient teaching. The program has also been rated as superior to many other popular programs (PDARounds, 2002). The project investigators, Dr. Michael Rice, MIRA program administrator, and Saleh Elgiadi, Director of Information Services feel that providing PDA devices will give the students the confidence to practice in these underserved areas once they have graduated. The graduate students will use PDA's during their clinical training in medically underserved, rural communities and clinics serving migrant/ethnic populations. Clinical training on the use of the PDA's will teach students how to directly access medical information and databases used in clinical decision making that otherwise would not be available in the rural clinical settings because of a lack of clinical experts and the lack of current technologies in these medically underserved geographies. The students will be oriented and trained in the use of the PDA's through established MIRA videoconference sites in one-hour seminars conducted by the project investigators. The effectiveness of the use of the PDAs for teaching and supervision in rural and medically underserved communities will be evaluated using three tiers of data. Each Tier of data is unique and offers some insight into the use and effectiveness of the PDA's as an educational tool in rural and medically underserved communities. The first tier of data will be evaluated using a traditional pre-post test design. Students will initially be screened prior to training on the PDA's using instruments developed for this project. The two instruments developed based on the Flashlight programs Current Student Inventory (CSI). The CSI is currently licensed and in use by over 120 institutions around the world. The CSI is a construction kit for creating surveys, interview protocols, and focus groups that gather information from currently enrolled students, on or off-campus. Each instruments is a mirror instrument designed to measure the change in the students' attitudes about the use of the PDA's. The initial measure "PDA Utilization and Cost Assessment: Time 1" will assess the student's beliefs and attitudes prior to use of a PDA in a clinical setting. The second instrument "PDA Utilization and Cost Assessment: Time 2" will measure their reactions to the PDA's when they complete their last clinical rotation. Each of the two instruments is composed of items that address areas of interest in the use of the PDA's. The instrument will gather student data on; 1. Participation (A), 2. Research (S), 3. Feedback, (F), 4. Time, Using Productively (D) and 5. Real world problems (X). A second tier of data will be gathered on the application and use of the PDA resources used by the students during their clinical training. Each of the PDA's is programmed with an Excel spread sheet entitled "PDA Client Contact Activity". This spread sheet will enable the students to complete the simple questions after each client visit. This data will be automatically downloaded on a periodic basis from the PDA's. A web site operated by the College of Nursing will provide the students with access to weekly information updates of the primary drug database. Students will connect their PDA's to their home computers and simply log on to the established web site. Once connected, the PDA's will be automatically synchronized and the information databases will be updated. The third tier of data will be gathered on the use of "Dr. Drugs". The Dr. Drug data base program provides automatic updates on all of the latest medical and pharmacological information. Each week, when in the process of downloading new information, the College web site will automatically upload and retain information on the areas of the database that have been used in the prior week. This information is then complied and sent to the investigators as a formal report. The information provided in these reports will indicate areas of interest in the clinical experiences and used to help tailor the curriculum. 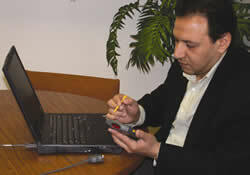 Use of PDA's will be systematically monitored using the established MIRA videoconference sites in one-hour seminars. Funds for videoconferencing, web site development and staff/faculty time are provided through the MIRA project funds from HRSA. The opportunity to learn the use of PDA, accessing resources and making clinical decisions based on accessible data bases will reduce the rate of errors due to drug-drug interactions, medical complications and will enhance the student's professional skills for post graduation practice in rural and medically underserved communities. Training the students in the use of PDA's during their educational programs provides them will skills and resources that they can continue to use after they graduate regardless of their location and distance to expert consultants. WSU College of Nursing MIRA Program Receives Grant for PDAs.